The hot weather started here in Eastern Ontario over the last couple weeks and up until this past weekend, it was usually quite manageable. Unfortunately on Sunday, with the humidity really high at 7am, I caved around 9am and turned on the air conditioning until about 10pm. Thanks to the Time of Use meter we have and Hydro One’s nifty online electricity usage tool, I’m able to see how much electricity we used to keep ourselves cool(er) for the day. Yeah, that’s a whopping 46.05 kWh used in one day. We are normally around 10-12 kWh/day. Ugh. Now, the graph above shows the cost per hour to run the AC (and I think the dryer must have been on to cause the spike around noon) but let’s remember that these rates are not the real rates we’re paying per kWh consumed. 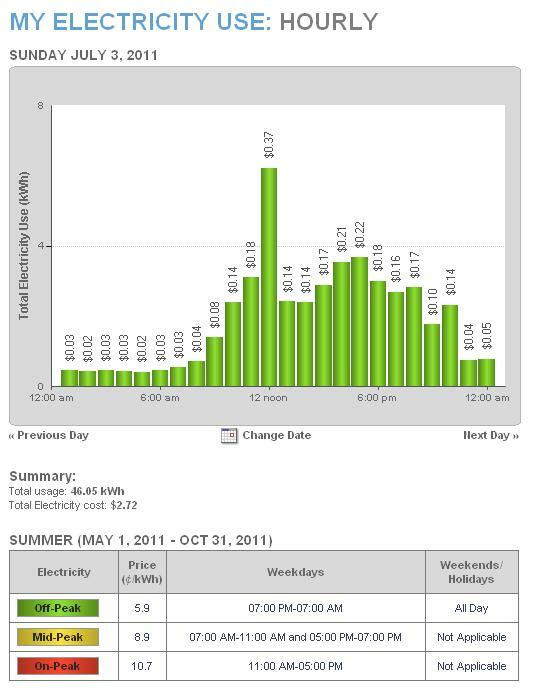 The real rate for the 2011 Summer Season for Off-Peak is more like 12.00892¢/kWh (based on Urban High Density and before tax). So, 46.05kWh is going to cost $5.53 (plus tax) and not the $2.72 shown by the graph. Guess we’ll be selecting our cooling days a little more diligently. This entry was posted in General and tagged electricity, Ontario, save money, Time of Use on 2011/07/06 by Jeff Ivany. I was recently looking at natural gas standby generators on the Costco website. Given the current electricity rates during peak Time of Use hours, I then started wondering what the cost per kWh was for a natural gas standby generator. Especially considering how low the natural gas prices have been. So let’s do some math. Fun! According to EnergyShop.com, natural gas is currently 25.04¢/m³ in my area. That includes all of the “add ons” that are over and above the posted natural gas rate. It excludes taxes though. As we saw before, your real electricity rate is not the same as what is “advertised” by Hydro One. We need to add in a number of extra charges to get the real rate. With the recent switch to the summer Time of Use pricing, the advertised rates increased. Based on the current Hydro One Residential Delivery Rates, the real Time of Use prices are (based on Urban High density) 12.01¢/kWh for off-peak, 15.24¢/kWh for mid-peak and 17.18¢/kWh for peak usage. Again, these are the rates without taxes added (and minus some monthly charges that don’t translate well into a per kWh price). So, let’s take the Generac 17 kW Standby Generator that is available on the Costco website, and figure out the cost per kWh. According to the website, it is capable of producing 16kW using natural gas and consumes 6.9m³/h at full load. So, that translates to 2.32kWh/m³ at full load. Given the current natural gas rate in my area, that means the standby generator costs 10.80¢/kWh. WHAT? Well, hang on, let’s not get too carried away with this. Natural gas prices are currently at all time lows. Let’s see how much it would cost with the ~50¢/m³ that we were paying a couple years ago. At that price, the generator costs 21.55¢/kWh to run. Let’s not forget about the cost of the generator – $3699.99 plus around $1000 of installation/other costs (based on some rough numbers I found while Googling). To cover that, you’d have to run the “standby” generator at full load during Time of Use on-peak time for about 67142 hours all while hoping that the natural gas price doesn’t go up. Oh, and don’t forget that peak time is only for about 6 hours a day and only 5 days a week. Oh well, that satisfied my curiosity. I did manage to find the Kohler Power 400RZX which is 400kW natural gas generator. It’s capable of around 3.3kW/m³ at full load or a cost of 7.5¢/kWh. Of course, no price is listed so I’m going to assume its payoff time would be greater than the 67000+ hours of the Generac unit. This entry was posted in General and tagged electricity, energy saving, Ontario, real world, Time of Use on 2011/05/23 by Jeff Ivany. 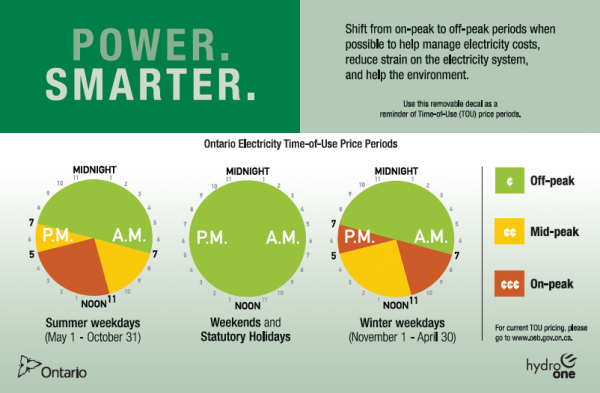 May 1 is the start of the summer season for Time of Use electricity rates in Ontario. For 2011, this brings one good change and one bad change. Let’s start with the good change – the off-peak rate now starts at 7PM instead of 9PM. This is a huge deal for us as the majority of our electricity usage is after 6PM. In the winter season, that was bad because the on-peak time was from 5PM to 9PM. At least in the summer, 5PM to 7PM is mid-peak so there’s a minor reduction in electricity rate. I think the extended off-peak will help a little more in the winter season. Now for the bad change – the rates at all levels have been increased by 0.8¢/kWh vs the rates we were paying in the 2010 winter season. So now instead of 5.1¢/kWh, we will be paying 5.9¢/kWh. That’s an increase of a whopping 15.7%. Ouch! So, even if you’ve managed to move most of your usage to the off-peak times, your bill is going up. Your base electricity usage cost is going to increase. Wasn’t Time of Use supposed to make it possible for consumers to save money? Hydo One has updated information on their Time of Use Prices web page. I don’t want to spoil your day so I won’t mention how much it’s going to cost to run your air conditioning this summer. Let’s just say that you might want to look at re-mortgaging now, especially considering how much it’s going to cost to fill your car gas tank. Ugh. So, what are your plans this summer to try and beat the heat while not breaking the bank. I’m all ears and would love to hear your ideas! This entry was posted in General and tagged electricity, energy saving, Ontario, Time of Use on 2011/04/30 by Jeff Ivany. File this one in the “You’ve got to be kidding” pile. The Ontario Energy Board (OEB) has approved a rate hike to cover approximately $18 million in fines and court costs associated with various hydro companies overcharging interest on past due accounts. So, not only are we potentially seeing a 6.2% increase starting March 1, we are paying extra because the hydro companies were breaking the law. Come on! Give me a break! It’s bad enough I’m paying $0.051/kWh in off peak times and $0.091/kWh in peak times when the average market price is $0.0342/kWh for February 2011. In 2009, Hydro One had a net income of $470 million (pdf link) on $4.744 billion in revenue or approximately 10% margin. WTF? I understand it operates as a private company and has to produce profit for it’s shareholders but shouldn’t it be attempting to pass some of that income back to the consumer through lower rates? We’re already being dinged for debt reduction, delivery, line loss, and whatever other things they can think of to squeeze more money out of Joe Average electricity user. Why not reduce that margin to 5% (which is still a huge net income of $235 million for Hydro One) and return $50 to each of the approximately 4 million homes in Ontario. Stop trying to take more money from my pocket and bring your income to a more reasonable level. This entry was posted in General and tagged Canada, electricity, energy saving, Ontario, save money on 2011/02/23 by Jeff Ivany. What is Your Real Electricity Rate? If you live in Ontario, you are usually quoted some nice low numbers as the rate you pay for electricity. When you take those numbers and plug them into some calculations, it doesn’t seem to make much sense to bother conserving electricity because the “potential savings” are rather low in most cases. But what is your real electricity rate? In Ontario, there are a number of other charges that get added to your electricity bill. Some are fixed monthly charges which you can’t avoid. The ones that are “hidden” are the charges where you pay more per kWh of electricity usage. Instead of just including these in the advertised and posted rates, they are sort of hidden to the consumer and often forgotten about when people are doing rough calculations on potential savings. Now, they aren’t completely hidden, your bill will have a nice total which sort of splits the charges out but it’s not always clear where the number comes from. Thankfully, companies like Hydro One (my electricity provider) are required to publish the numbers. What we are interested in are the Residential Delivery Rates. Here is the current (May 1, 2010) breakdown from the Hydro One page. WOW! Those prices suddenly seem much higher but we’re still missing one more thing – HST! You need to add another 8% onto the price you see above. Well, let’s look at something simple – if you can reduce electricity consumption by an average of 50W/hour every day for a year (which isn’t that difficult if you remember to turn off some of the big items like TVs, computers, etc when they aren’t in use), that would reduce your consumption by 438kWh/year. With the regular posted rate of 6.4¢/kWh that appears to only save you $30/year. Not a whole lot. But, what are you really saving if you live in an High Density location (for example)? You are potentially saving $61/year. That’s easily a case of beer and a couple decent steaks for a pretty simple 50W/hour reduction in electricity usage. How do I reduce my usage by 50W/hour? Yeah, I knew I’d get you with the case of beer. Why not check out my Woods Smartstrip power bar save money post for information on a relatively easy way to do this. Other options include using CFL and LED lighting, reducing your screen time (TV and computer), or simply turning off items or lighting that isn’t needed. This entry was posted in General and tagged electricity, energy saving, Ontario, save money, Time of Use on 2011/02/21 by Jeff Ivany.